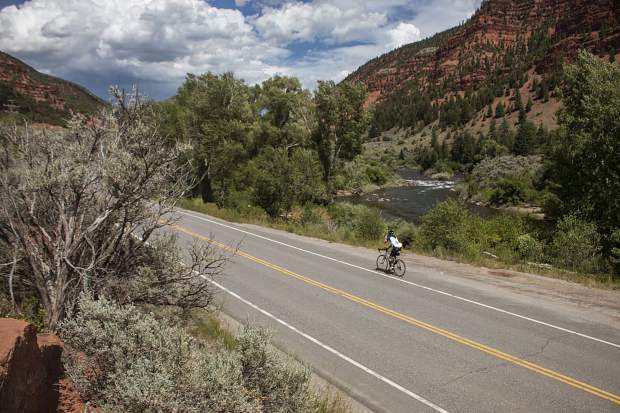 A cyclist rides alongside the Eagle River in Edwards. The 2018 Ride the Rockies will begin and end in Breckenridge and will showcase local attractions including State Bridge and the town of Edwards. The Denver Post Ride The Rockies Bicycle Tour presented by Flexential announced its 2018 tour route to an excited crowd gathered for the annual Ride the Rockies Route Announcement Party held at the Cable Center on Saturday, Feb. 3. The 2018 ride will be a loop, beginning and ending in Breckenridge and showcasing the communities of Breckenridge, Edwards, Steamboat Springs, Grand Lake and Winter Park. The tour will span over six days beginning with the Ride the Rockies Bike Expo on Saturday, June 9, and ending with finishline festivities on Friday, June 15. Each town in the 2018 tour offers spectacular hospitality and the quintessential charm of Colorado’s mountain culture. Tour highlights include Fremont Pass, Tennessee Pass, State Bridge, Rabbit Ears Pass and Ute Pass. The tour will cover 418 miles and ascend 25,935 vertical feet in elevation as Ride the Rockies riders experience endurance days as well as days of lower mileage. For the first time, on June 12, Ride the Rockies will open up the ride to outside participants for Ride The Rockies’ Steamboat Springs 1-Day Loop. The loop-day ride, open to riders and locals alike, will be 48 miles and end with an unforgettable party in Steamboat. Ride The Rockies, the biggest fundraiser for The Denver Post Community Foundation, has opened up their registration for applicants to sign up on a first come, first served basis, moving away from the former lottery process. Registration prices are tiered, allowing the first 500 applicants to register at the lowest Tier 1 price level. The 33rd annual RTR tour will admit 2,000 cyclists who will join us from around the state, across the U.S. and even overseas. Cyclists will have the opportunity to either camp or stay at hotels in the different host communities that RTR visits along the route. At the heart of Ride the Rockies is a group of people who make the tour possible and consider Ride The Rockies to be like family. These loyal volunteers have been involved with the Ride the Rockies tour since its inception and continue to pour their time, energy and passion into making the tour a classic Colorado event. Prior to the tour, the Ride The Rockies VIP Prologue Experience will take place Friday, June 8 — Sunday, June 10, near the start line of Ride the Rockies in Breckenridge. Prologue participants will ride, wine and dine with cycling celebrities in Breckenridge. Prologue riders will join an elite group of celebrity cyclists, including cycling legends Mara Abbott and Chris Anthony, for a ride up and over Hoosier Pass, ending in Fairplay, where the VIP group will enjoy an elegant lunch and wine tasting in the middle of South Park City, a restored mining town. The dining experience will continue after guests enjoy afternoon massages with a western dinner served at the famous Country Boy Mine.